Russia has ranked up from the 6th to 5th for the year (2016), and relegated South Korea in the top steel-producing countries list. Domestic steelmakers also reduced steel production, but in a lesser degree than that observed in most other countries. The decrease on home market was offset by a sharp rise in export demand, which was due to the devaluation of the Ruble, and thus, increased the competitiveness of Russian steel production. Below is a list of the largest Russian steel companies, which produce pig iron, cast round billets, strips, shipbuilding steel, hot-rolled steel, cold-rolled steel, galvanized steel, pre-painted steel, square billets, pipe billets, rolled steel, metalware, billets, Direct-reduced iron (DRI), iron ore pellets, high transformer steel, grain-oriented electrical steel, hot rolled sheets, springs, iron sections, railway wheels, train rails, slabs; oil, gas, water supply pipes for the oil and gas, construction, automotive and machinery industries. 1) Novolipetsk Steel (NLMK) is a Russian metallurgical company, which comprises largest metallurgical mill in the country. Full name – Public Joint Stock Company “Novolipetsk Steel”. It’s located in Lipetsk. 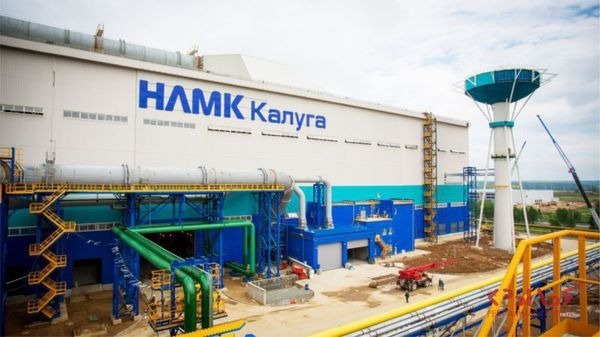 NLMK is located 350 km far from the Kursk magnetic anomaly – a major supplier of raw materials for the company, and 500 km far from Donetsk coal basin. NLMK’s share of Russian steel production is 22%. Assets: Novolipetsk, NLMK Ural, NLMK Metalware, NLMK Kaluga, VIZ-Stal, NLMK DanSteel (Denmark), NLMK Belgium Holdings, NLMK Manage Service Center, NLMK Indiana, NLMK Pennsylvania, Sharon Coating, Stoilensky GOK, Vtorchermet NLMK, Altai-Koks, Dolomit, Stagdok, Novolipetsk. VIZ-Stal is a producer of cold-rolled electrical steels. Verkh-Isetsk plant is a part of NLMK Group. Verkh-Iset metallurgical plant is located in the city of Ekaterinburg (Sverdlovsk Oblast). Production: 0.23 to 0.50 mm thick, up to 1000mm width grain-oriented electrical steel. 2) Evraz is la eading mining and metallurgical company with assets in Russia, Ukraine, USA, Canada, Czech Republic, Italy, Kazakhstan and Republic of South Africa. Steel and Iron Ore assets: ZSMK (West-Siberian Metal Plant; Novokuznetsk Metallurgical Plant Novokuznetsk, Kemerovo Oblast), NTMK (Nizhniy Tagil Iron and Steel Works), Caspian Steel (Kazakhstan), DMZ integrated steel mill, Highveld Steel and Vanadium (South Africa), EVRAZ Palini e Bertoli (Udine, Italy), EVRAZ North America, EVRAZ Sukha Balka, Evrazruda, EVRAZ KGOK. 3) Magnitogorsk Iron and Steel Works (MMK, <>) is a leading Russian metallurgical company. It is located in the city of Magnitogorsk (Chelyabinsk Oblast, Ural region). 4) Severstal is a Russian steel and mining vertically-integrated company, which consists of two divisions: Severstal Russian Steel and Severstal Resources. It owns assets in Russia, Ukraine, Latvia, Poland, Italy, and Liberia. 5) Metalloinvest is one of the largest mining and metallurgical holdings in Russia. It includes mining a division (Lebedinsky and Mikhailovsky mining and processing plants) and a metallurgical division (Oskol electrometallurgical plant (OEMK), Ural Steel, Ural Scrap Company). Also, Metalloinvest owns 80% of the steel plant Hamriyah Steel, located in the United Arab Emirates. The structure of the main plants of the Holding is supplemented by auxiliary assets, which include secondary metal processing business UralMetCom and leasing company Metallinvestleasing. 6) Mechel, one of the world’s leading mining and metallurgical companies, comprises producers of coal, iron ore, steel products. Steel assets: Chelyabinsk Metallurgical Plant, Beloretsk Metallurgical Plant, Izhstal, Urals Stampings Plant, Donetsk Electrometallurgical Plant, Vyartsilya Metal Products Plant, Mechel Nemunas, Bratsk Ferroalloy Plant, Southern Urals Nickel Plant, Kaslinsky Plant of Art Casting. 7) TMK (Pipe Metallurgical Co., OJSC) is a Russian metallurgical company, one of the worlds leading producers of tubular products, which are primarily used in the oil and gas industry. Also, TMK products are used in chemical industry, energy, machine building, construction, shipbuilding, aviation, aerospace, agriculture and other sectors. Read coreplanets blog. Assets: TMK Russian Division (Volzhsky Pipe Plant, Seversky Tube Works, Sinarsky Pipe Plant, Taganrog Metallurgical Works, TMK-CPW, TMK-Kaztrubprom, TMK-INOX); TMK American Division (TMK IPSCO, Houston, TX); TMK European Division (TMK-ARTROM, TMK-RESITA, TMK Europe GmbH, TMK Italia s.r.l., TMK Industrial Solutions LLC), TMK Middle East Division (TMK GIPI). Products: drill pipes, well casings, line pipes (seamless and welded), seamless industrial pipes, large diameter welded pipes, and welded industrial pipes. Products: steel pipe products, trunk pipeline systems, and electric submersible pumps. 9) United Metallurgical Company (AO OMK) is a group of metallurgical enterprises, which are located throughout the country, and it’s original consolidation was launched in 1992. AO OMK consists of seven metallurgical plants: Vyksa Steel Works (large diameter pipes, hot rolled wide sheets, oil and gas pipes, water supply pipes, casting pipes, shaped pipes, hot rolled sheets, railway wheels), Almetyevsk Pipe Plant (oil and gas pipes, water supply pipes, shaped pipes), Chusovoy Metallurgical Works (springs, iron sections), Trubodetal (pipeline fittings), Blagoveshchensk Valves Plant (pipeline valves), Foundry-rolling Complex, OMK Tube. Pipes manufactured at the OMK enterprises, used in the construction of the largest Russian and international gas pipelines, such as Nord Stream, Baltic Pipeline System, Southern Corridor, North-European gas pipeline, Central Asia-China, Eastern Siberia-Pacific Ocean, and Sakhalin – Khabarovsk – Vladivostok. 10) OAO Amurmetall is the only metallurgical plant in the Far East of Russia (Komsomolsk-on-Amur), which produces steel using electric steel-making technology with further redistribution in rolled and profiled sheet products. Business stainless steel producers in russia. permalink. No. 7/4, Skelton Road, Colombo 05, Sri Lanka. No. 350-2nd, Floor, Sri Sangaraja Mawatha, Colombo 10, Sri Lanka. Enquiry no. 2017/200 of 03.10.17.
marked with size, thickness, standard and mills name. all other terms and conditions of sales. Final invoicing at actual nett weight basis. Mills test certificate is required. Best regards. / Ratnam Ganesh. Request send your catalogues / website link / mill test certificate of any similar material produced in the past / tentative prices so that the customer can select required thickness as well as losses which suits him best. In event of an order payment shall be by LC. On submission of the above we shall follow up the customer for approval of your material. Advise if yo are represented in Pakistan or are free to work with us.